To say Americans “lost’ their homes implies it was their fault ~ those Americans should have been more careful. When someone is mugged and has wallet and watch taken, we don’t say the victim’s wallet and watch were lost. 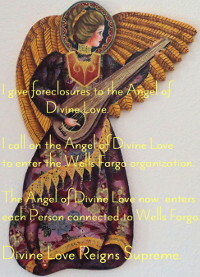 Americans who had their homes taken by banks using fraud, deceit, dishonesty and deprivation of due process did not “lose” their homes. They had their homes Taken. By establishing the language we use in different situations, media effectively dictates the deeper meanings that we attach to the words we use, whether we use them unwittingly, or more knowingly. 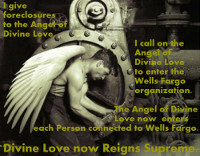 I would think banks knowingly say Americans Lose homes. Banks want Americans to blame homeowners, not banks. 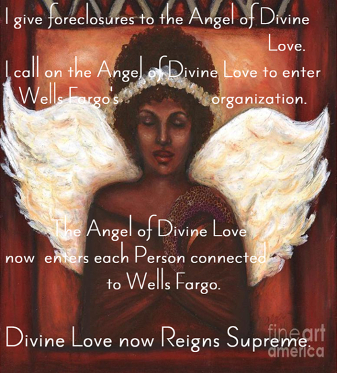 So banks can’t say Americans have homes taken, because if they said that, then all too quickly people would begin seeing the malicious, sinister role played by banks. 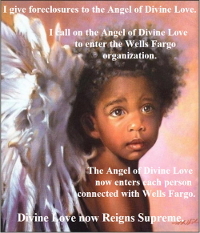 Image Credits ~ Angel by Alga Washington, View gallery.